EPRS was developed over six years to provide services in all types of environmental situations and geotechnical configurations and to address the inherent challenge of accessing delicate areas not normally serviced from sea or shore, said a statement from Marsol International. 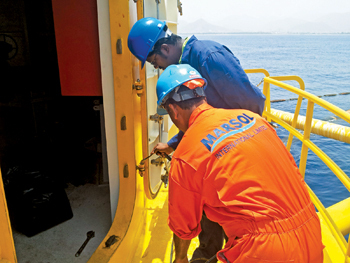 Marsol has worked with various partners to develop multipurpose tools and equipment which offer functionality and versatility resulting from the company’s experience in developing specialist diver-operated equipment, capable of work in dry areas, the intertidal zone and subsea, it added. Due to various clients’ requests for a turnkey solution, EPRS has been launched to best serve the needs of a niche market in the environmentally delicate intertidal zone. This requires a different, but complementary skills set involving subsea or deep-water pipeline repair, said the statement. It will utilise the company’s experienced offshore terminal and marine workforce to locate and stabilise the ground to access damaged pipelines in the intertidal zone, and to implement the requisite pipeline repair. Repair scenarios such as pipeline rupture, pin-hole leak, dents and buckles, internal and external pipeline pitting and problems due to corrosion are considered pipeline emergencies. EPRS will be driven by the nature of pipeline failure or damage, pipeline size and specifications as well as site location. It offers a complete range of specialised equipment required for work in intertidal zones – including multi-purpose amphibious units, amphibious excavators, modular trench shoring systems and all-terrain/amphibious personnel carriers, it said. Since 2005, based on experienced gained over 46 years, Marsol provided operational engineering and management solutions to clients, consultants and engineering, procurement and construction (EPC) contractors for new offshore terminal facilities, and operational integrity management and IRM services of existing facilities to offshore terminal owners and operators. Mike Young, managing director of Marsol International, said: “Marsol has a strong team of engineers who understand first-hand the real-life scenarios in a busy oil export hub. “We have identified a need to offer an emergency service to protect pipelines in shallow waters, and we have the skills and equipment to manage the challenges intertidal zones present, such as shifting sands and tides. “Marsol has worked to develop sophisticated support assets such as Rhino craft and Versadock – products that have been tried and tested in hostile and difficult environments.